Yesterday, I finished grading the exam, so it is about time for a recap: how did it go? 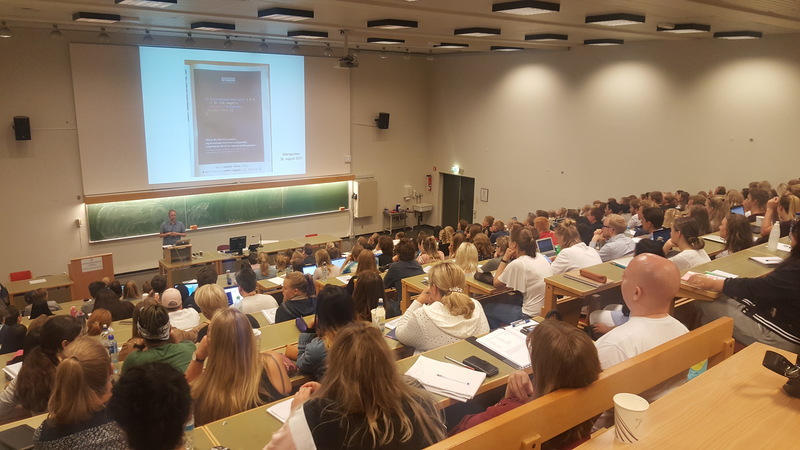 There were 200 students present at the first of the weekly lectures. Each week, they would have a four-hour datalab session in the new ‘bring-your-own-device’ teaching room, where 60 students would sit in groups of 6 at hexagonal tables, with for each table a big screen available that any student could connect to from their laptop (all screens could project what was shown on the central screen, or on any of the other screens, really fantastic). A typical datalab would start with formative assessment in the form of multiple choice questions (see ‘Peer instruction through quizzes’ in this blog post). This was often followed by ‘Computer Science Unplugged‘-type activities, pen-and-paper exercises to introduce programming concepts. Then they would work on programming exercises. The figure below gives a broad overview of the structure of the book, a structure that was followed during the course. The philosophy for the book, and the course, was not teaching lots of Python first and then showing how it can be useful to solve biological problems, but introduce the biological problems first, and the Python concepts needed to solve them right after that. This way, all the learning of Python happened in the context of the Biology. The course book and materials will be published (Open Access!) in 2018. In my previous post I identified a number of plans and challenges I had in advance of the first course edition, and I will comment on them here. I wanted examples and exercises to be using data and questions that the students can relate to, given that they are studying biology/biosciences. This was implemented to a large extent, and I feel this worked quite well. In preparation for the course, multiple ways were discussed to build a bridge with the Cell- and Molecular Biology course the students were taking the same semester. Students used Python to plot some of their laboratory measurements, calculated resolutions for different microscope lenses, digested the same DNA that they were going to digest using restriction enzymes in the molecular biology lab, in silico with Python. Students responded positive to having the exercises being relevant for their field of study, as well as seeing material used in both courses. I am generally very happy with the choice of the Jupyter Notebook and the course room. There were no software installation issues and having a completely similar online environment (through JupyterHub) for all students, to which I could easily push new material, made organising the course much easier. There were some technical difficulties with the JupyterHub implementation – we were the first course to use it and ran into some unfortunate downtime, leading to understandable student frustration. I had intended to use a ‘flipped classroom’ model, but did not manage to find a good way to make sure students had studied the relevant material from the book in advance. I had 19 learning assistants, master student and PhD students. Recruiting them happened rather late, which prevented me from having more than one meeting with them to prepare them for the course. But they were an enthusiastic bunch, and worked hard with the students. Much of the learning that happened was thanks to them. I struggled to really built a community, not many showed up at the (voluntary) weekly meeting. the motivational aspect: these students chose to study biology, not programming. Although I have not done a careful analysis, talking to students told me many saw the relevance of the course material for their studies in general. one goal for the study program is to continue learning and implementing CSE in the student’s next semesters. So far, in the student’s second semester, they will meet Python again in two of the three courses they take. In the third semester, they switch to R in the statistics and evolutionary biology courses. A big challenge with any (totally) new course is that much, or all, of the material needs to prepared for the first time. A lot of this work was done before the course started, but unfortunately, not many exercises were ready beforehand. This led to me spending most of my time during the semester preparing exercise notebooks. This situation had several drawbacks: students and assistants did not have access to next week’s exercise material until the first day it was going to be used in class. I could not spend much time interacting with the students during their datalabs. It was also quite stressful. When I first thought about how to organise the teaching for this course, I strongly believed that the Software Carpentry approach of live-coding would be the best way to do it – it is after all how I do most of my teaching. With live-coding, an instructor or teacher does programming in real time and students in the room follow along, performing the same programming themselves – intermitted with many hands-on exercises. But at some point I started to worry live-coding wouldn’t scale to the 60 students present in the datalab, let alone the 200 students during lecture. Consequently, I dropped live-coding as a possible approach to teaching Python for this course. When I discovered that many students were not learning the material, I decided to switch gears and go back to the live-coding approach. I announced that we were going to skip the material of the last two chapters of the book, and replace the remaining datalabs with repeat-teaching of the programming concepts. I did this through live-coding with the students, and also (finally) found a set of hands-on exercises that were very good for practicing more. The last three weeks of teaching were done in this way, and around 60-70 students came to these sessions. Feedback from the students was very positive: many were relieved and thankful, and felt they finally understood what this programming business was about. Interestingly, a handful of students were disappointed that the last part of the course material was skipped and asked whether they could still get access to it. In the words of the study-administration: “students never ask for more material, but for this course they did…!”. In conclusion, I can only repeat “I thought the Software Carpentry live-coding approach wouldn’t scale to a large undergrad Python course and that I could do without it. I was 2x wrong”. So how did the students do? 180 students were allowed to take the exam, and 169 did. 80 % passed the exam, with an average C grade (scale A-F). From looking through the results, I saw a lot of learning has happened – although quite some misunderstandings remained. I decided that these results are actually not too bad for a first edition, and I’m actually quite happy with them. All in all, organising this course has been (one of) the biggest and demanding projects I have ever undertaken, but I don’t regret one second accepting the challenge. The current generation of students will meet big datasets and complex analysis and modelling (Machine Learning! Artificial Intelligence!) whatever they end up doing in their professional lives. I am very proud to be a part of a (larger) effort to make sure they will be prepared for this once they graduate from our university. As part of the bachelor-studies reform here at the University of Oslo, the Institute of Biosciences, where I work, is reorganising its bachelor curriculum. One exciting part is the implementation of the Computing in Science Education (CSE) project, into the different subjects. The goal of the CSE project is to make calculations/computing an integral part of the bachelor curriculum from the very first semester, interweaving the subject-specific material with mathematics and programming. CSE has been working successfully with the curriculum of the Physics, Mathematics, Informatics, Chemistry and Geology. Starting from the fall of 2017, Biology is next. The Institute of Biosciences, with the CSE project, set itself an ambitious goal: in the first semester for Biosciences students, one of the three parallel 10-credit courses should be focussing on the CSE aspect. We named the course ‘Introduction to Computational Modelling for the Biosciences”. Four smart PhD students, with backgrounds in physics. informatics and biology, were tasked with writing a book for the course, in which they mix biology with programming in python and modeling of biological phenomena. The CSE project and the institute have given me the opportunity (and honour) of developing this book, with the authors and the CSE project team, into a full first semester course for Biosciences students. This course (BIOS1100) is starting this fall (August 2017). Wow. No small task. How to make sure 150 students (perhaps more) become, and then stay, motivated to learn programming in python and developing mathematical models, while what they really signed up for was studying biology! How to make sure the material appears relevant, and is seen as necessary for becoming a biologist? In preparing for teaching the course I have landed on a number of principles I want to adhere to, and ideas that I want to try, to ensure the course will be a success. Some of these are based on experiences obtained from previous courses developed within the CSE framework, as well as on my previous teaching experience. A significant part is based on my experience as a Software Carpentry instructor and instructor-trainer. Examples and exercises should be using data and questions that the students can relate to, given that they are studying biology/biosciences. As an example, another ‘CSE’ course uses a formula to calculate the time it takes for the centre of the yolk of an egg to reach a certain temperature. The students are asked to implement this formula in python, and calculate the time for the yolk to reach, say 70 C, when the egg is taken from a refrigerator into boiling water. I can still use the same formula, but would place the exercise in the setting of a chicken farmer, that would like to know how long a hen can be away from a fertilised egg before the temperature of the embryo becomes too low. My hope is that by exposing students to the subject in multiple ways, on multiple occasions, learning about restriction digestion becomes more effective (and perhaps also more fun). I also am looking into the labwork the students will do in the parallel courses to see whether they generate any datasets that can be further analysed using python or modelling. I suspect that working with data students generate themselves (i.e., have ownership over) enhances motivation and increases learning outcome. One cannot learn programming from slide-based lectures. Much of the learning will have to be done ‘by doing’, in group work. I will use the Jupyter Notebook, the “killer app” in education according to professor Lorena Barba, in a flipped classroom approach where students study notebooks beforehand (each chapter of the course book can be turned into a notebook), formative assessment is used to gauge understanding, and students work with exercises during ‘class’. 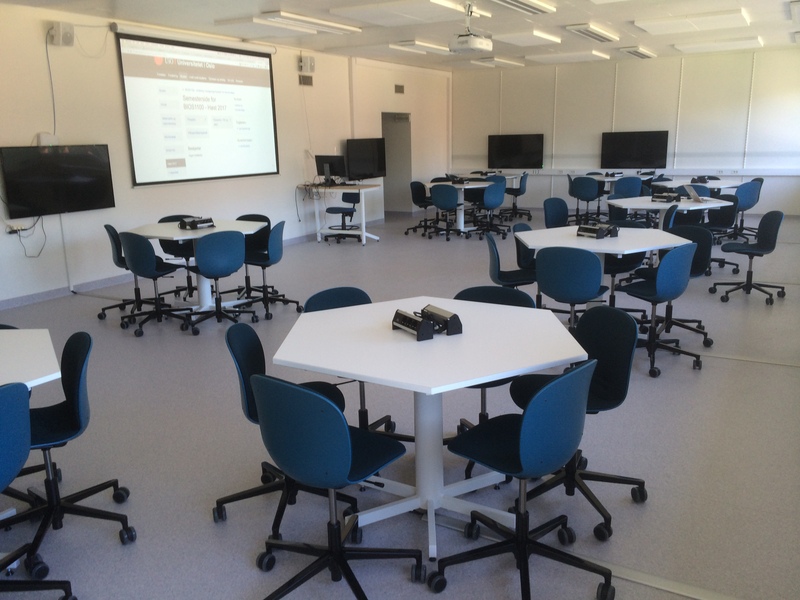 We have the fortunate situation that we could design a new classroom to be used for this and others courses. Inspired by a teaching room at the University of Minnesota and this publication we will fill it with hexagonal tables that each have their own large screen for students to share. We will be using a ‘bring-your-own-device’ approach (students working on their own laptops) rather than through Data Labs with stationary, university PCs. This ensures learning can continue on the students own equipment, wherever they are, whenever they want to. I need to recruit quite number of learning assistants, PhD students and others that work with the students during group work. The aim is one assistant per two hexagonal tables (12 students). How they interact with the students will influence the learning and student experience significantly. I aim to have a couple of small workshops with them before the course starts (using some of the Software and Data Carpentry Instructor Training material for inspiration). During the course we will need to meet weekly to discuss what went well and where we can improve. We will also need to document all this for the next editions of the course. These weeks, we are trying out some of the material on a small group of current first year bachelor students. This turns out to be very useful, it makes us think about many aspects that otherwise first would have become apparent during the real course. For example, I had first thought to do quite a bit of learning through live-coding, Software Carpentry style. However, I have come to realise that live-coding does not scale: classes will be 50-60 students rather than the typical 20-30 for a Software or Data Carpentry workshop. The chances for delays due to a student getting into a technical problem are much higher, and the number of people affected by the delay much larger. This will cause problems to keep the group’s attention and may become demotivating. A major challenge will be the motivational aspect, and we should get feedback from the students on this and other aspects frequently. I have lot’s of ideas on what to try to improve the students’ learning and experience but will need to limit myself this year to getting through the course. Finally, the overall aim is not to have this work stop with this one single course. The goal is that all other Biosciences courses incorporate modelling with python, and also R, in group and project-based work. This requires the collaboration of all teachers in the department. At a departmental teaching seminar last year everyone was very enthusiastic. Soon is the time to turn that enthusiasm into concrete projects. … then this one-week workshop is for you! When: June 18-June 25, 2017 (likely we’ll only use Monday-Friday). and repurposing the Software Carpentry, Data Carpentry, or Analyzing High Throughput Sequencing Data materials. We envision this course being most useful to current teaching-intensive faculty, future teachers and trainers, and core facilities that are developing training materials. Attendees will learn about and gain practice implementing evidence-based teaching practices. 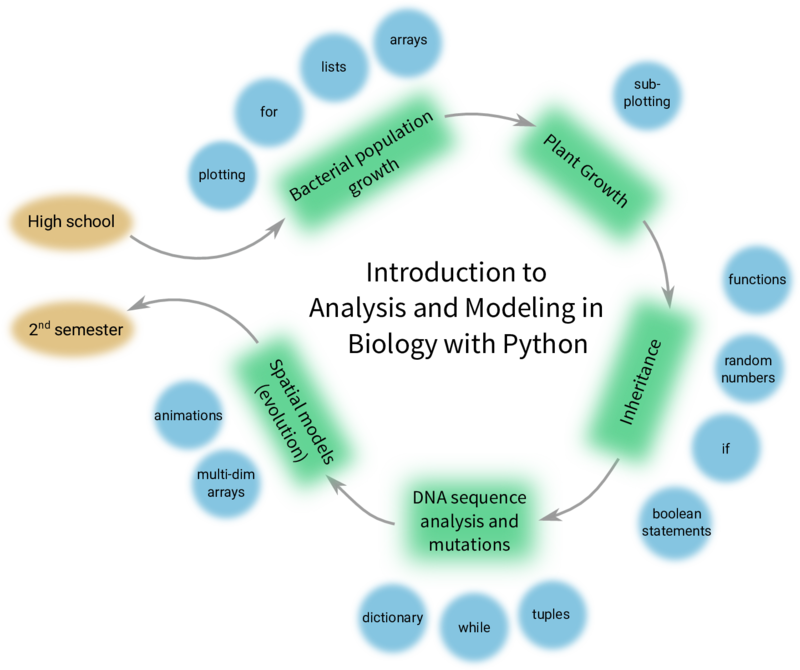 Common pitfalls specific to novice-level instruction and bioinformatics in particular will be discussed, along with associated troubleshooting strategies. Content used in prior ANGUS workshops on Analyzing High Throughput Sequencing Data will be used for all practice instruction, and experienced instructors will be on hand to address questions about implementation. Attendees of this workshop may opt to remain at the following ANGUS two-week workshops so that they can gain hands-on experience in preparing and teaching a lesson. This week-long training will also serve as Software/Data Carpentry Instructor Training. Attendees should have significant familiarity with molecular biology and basic experience with the command line. We anticipate a class size of approximately 25, with 3-6 instructors. The official course website is here. Applications will close March 17th. If you have questions, please contact dibsi.training@gmail.com. You were a pioneer, the first successful ‘next generation’ (if you’ll pardon the term) commercially available sequencing platform in 2005. You just beat Solexa, but it was a fairly close call. 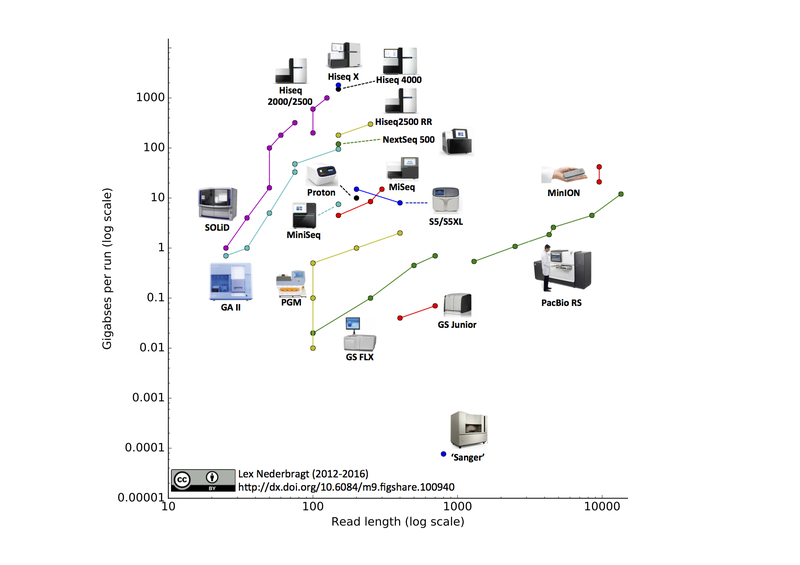 Your greatest accomplishment was to show that pyrosequencing, which was around for a while already, could be scaled up, both in terms of read length and parallelisation. You started the revolution in DNA sequencing, suddenly making large scale genomic projects available to labs that traditionally only could dream of been doing such projects at this scale. This is the fifth edition of this visualisation, previous editions were in June 2015, June 2014, October2013 and December 2012. I added the Oxford Nanopore MinION. The read length for this instrument was based on the specifications for maximal output and number of reads from the company’s website. The two data points represent ‘regular’ and ‘fast’ modes. I added the IonTorrent S5 and S5XL. You may notice that the line for this instrument has a downward slope, this is due to the fact that the 400 bp reads are only available on the 520 and 530 chip, but not the higher throughput 540 chip, making the maximum throughput for this read length lower than for the 200 bp reads.